Several months ago Lakewood Ranch Country Club decided to dedicate a room within the clubhouse to the enjoyment of fine wines – an area with the ambiance of a private wine cellar; where members could sip their personal favorites or find a new one. 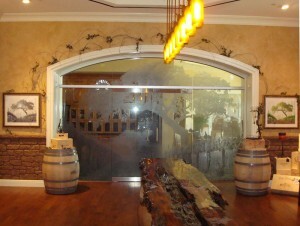 The room dedicated to this purpose has a glass wall with entry; and club management wanted to add something – a decorative touch that would be subtle, but add a level of separation and a sense of some privacy from people passing by on their way to other function rooms within the club. Shane Pringle, Assistant Director of Food and Beverage Services approached Solar-X of Sarasota for any suggestions we might have. 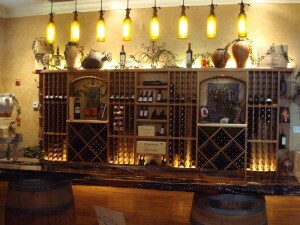 Senior sales representative Brian Gregg had what turned out to be just the right solution. 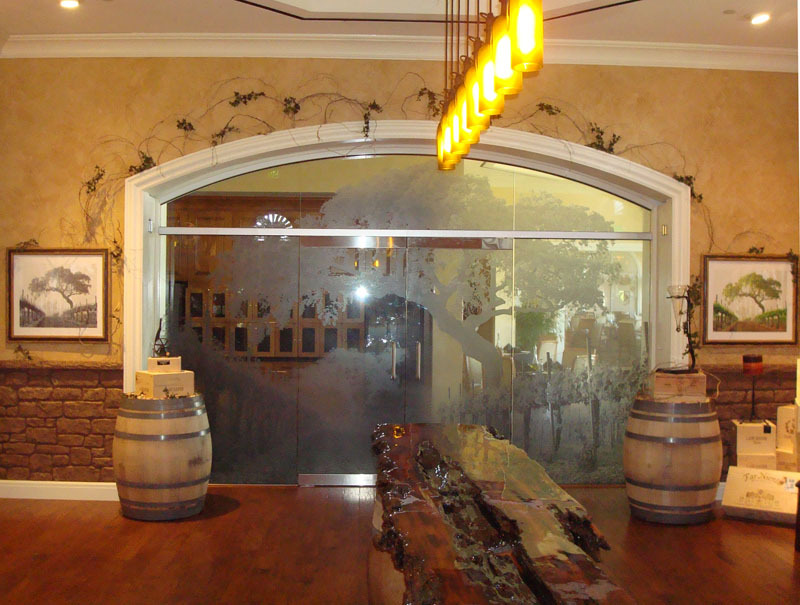 Brian suggested an “architectural wrap“; in this case an image of trees and vineyards – very subtle, in tones of black and grey with a slightly frosted effect – a process called UV solvent printing. 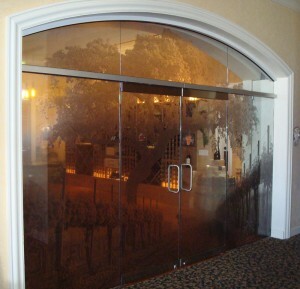 The image allows people to see in and out of the room, but adds a certain “feel” of privacy, and a sense of being in the wine regions of Europe. After approval of the sample image, an order was placed and the product arrived in plenty of time for the scheduled installation prior to opening. The “pieces” of the image were checked for proper alignment, and installed on the glass wall, where bystanders watched while the picture took shape. A short while later, the wall was transformed into the image you see above (click on the image to enlarge), and club management couldn’t be happier with the job. The final touch of ambiance is now in place, and the room is ready to be enjoyed by all who pass through those beautiful doors! Whether it is high quality window film, decorative vinyls, or today’s most sophisticated printed “wraps,” Solar-X of Sarasota has the talent and experience to bring your ideas to life. Call us with any idea that brings together “art” and “applied products” and we’ll deliver a finished product that will amaze you. Whether you are an architect specifying products for a project, or a homeowner who wants to add “something” to a plain glass door, we have the products. Contact us today, and we’ll get you started!